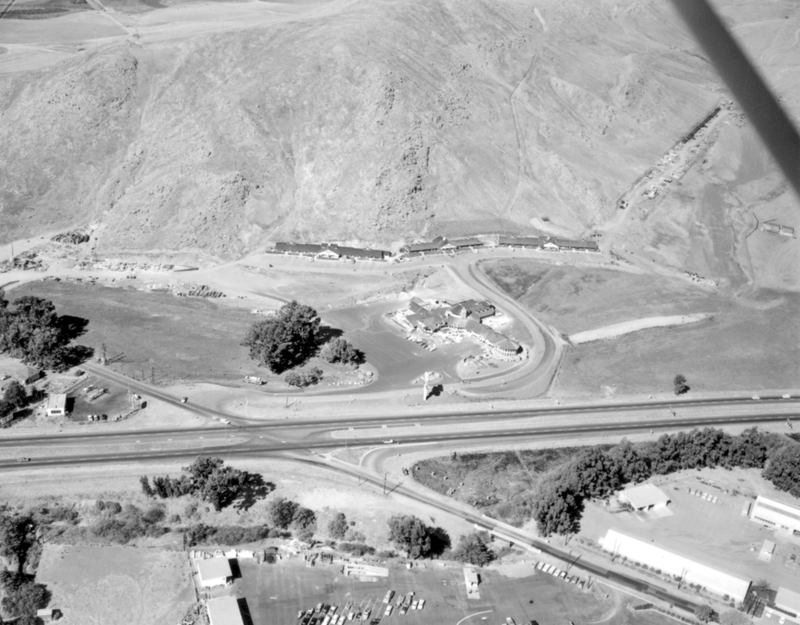 Notice how the original entrance and sign are located right on the 101 highway in the early '60s. 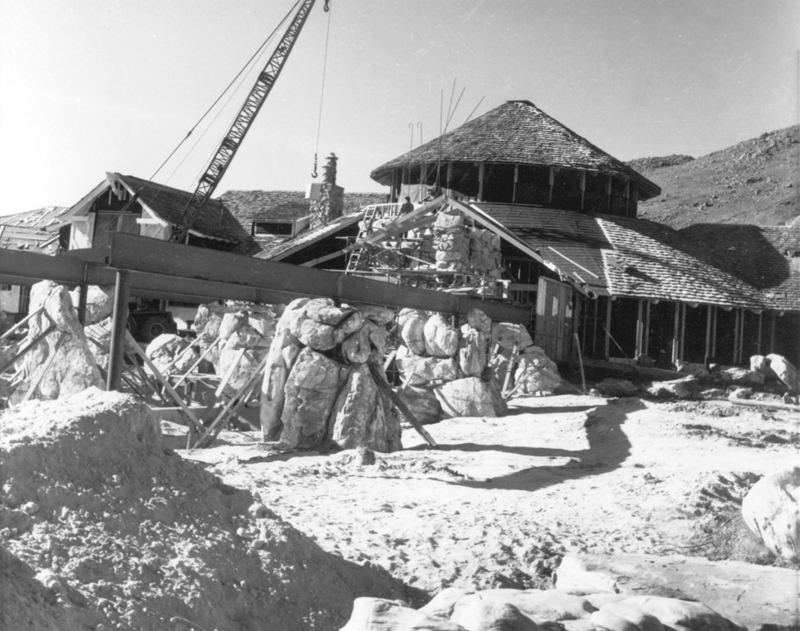 Boulders used in construction of the Madonna Inn, some weighing as much as 200 tons, came from San Luis Mountain adjacent to the Inn. Alexander Zeller, renowned Bavarian woodcarver and sculptor, whose work can be seen throughout Madonna Inn. The Hearst Family presented Alex with the hand-carved, white marble balustrade to show their appreciation for a favor. 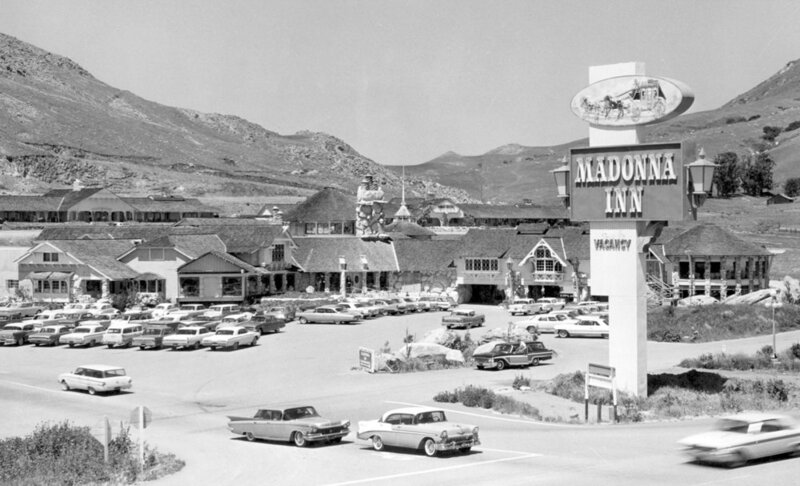 On August 1, 1954 Alex Madonna purchased 10 acres of land at a silent auction where the Madonna Inn now stands. Many people have asked for a history of Madonna Inn, so with this brief story, we will attempt to tell you how it all began. The first 12 rooms were completed December 24, 1958, and were given complementary for that night’s stay, to a very surprised group of travelers. An additional 28 rooms were quickly built, making a total of 40 rooms available to travelers. Demand for public areas to handle the rooms encouraged us in April 1960 to start construction of the main inn, which was to eventually consists of the wine cellar, bakery, coffee shop, dining room, the cocktail lounge, banquet rooms, ladies’ boutique, men’s gift shop, and the gourmet shop. The Madonna Inn sits on over 1,000 acres and the large rocks used in the construction came from these surrounding acres. Some of the larger rocks weigh in excess of 200 tons each. The hand-carved marble balustrade in the Gold Rush dining room came from the Hearst Castle. All copper and brass items were etched and/or shaped from original designs and fabricated right on the premises. The 16'4" tall, 29'6" wide gold tree fixture in the main dining room was made from electrical conduit left over from building projects as well as from left over remnants of copper. » Read more about Alex Madonna and the Madonna Inn on Wikipedia.